Villa Sanibel is a small, 20 unit Gulf front complex located near all the Island conveniences on West Gulf Drive. This quaint community offers a heated pool, gas grills, and tennis, all surrounded by lush tropical landscape. Unit 3D is a second floor walk-up unit (sorry, no elevator) with vaulted ceilings and pool views from your private, screened-in lanai. This spacious unit can comfortably accommodate up to 8 guests with king beds in both the master and guest rooms, a 3rd floor loft with 2 twin beds for additional sleeping space and a queen sleeper sofa in the living room. 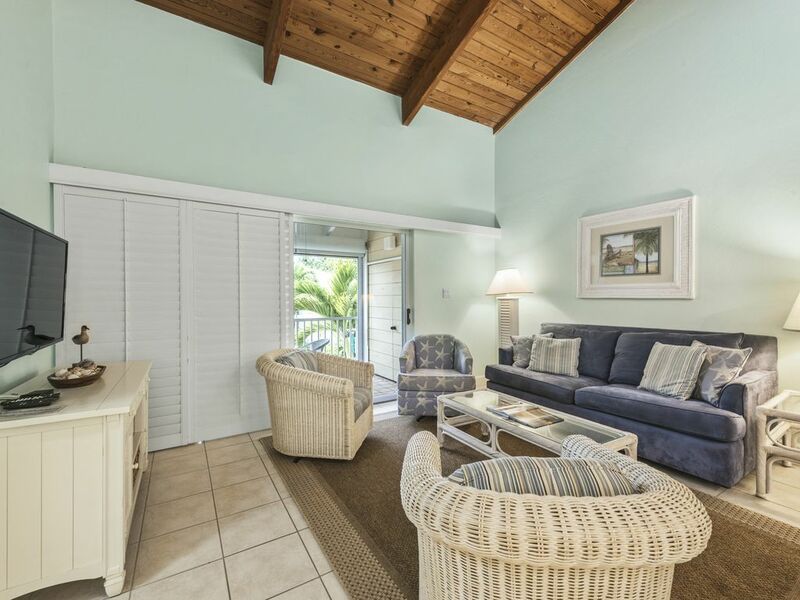 The owner has nicely decorated, furnished and updated the entire unit and equipped it with 2 flat screen TV’s, DVD player, beach equipment and secure Wi-Fi for your enjoyment. Villa Sanibel is a smoke-free property. This is our 2 Nd yr at Villa Sanibel. We love it&#x2019;s location! Condo has everything you could possibly need including beach chairs, boogie boards and beach toys. It is a great location for families or for just a quiet get a way. Nicely decorated, great location, quiet and relaxing complex. I am very happy we chose this unit in a small complex. The condo complex itself is well maintained, couldn't ask for closer beach access, has a nice pool that wasn't crowded. Our unit was modernity decorated with a very beachy theme, the beds were comfortable, and the kitchen was well stocked with dishes, pots and pans. Also this unit is great for children, there are lots of games if you happen to be indoors but more importantly the storage closet was loaded with beach items like buckets, shovels, noodles, chairs, and umbrella, and beach cart. Only thing that would have made the closet complete would be a cooler. There were also tennis racquets and balls for the tennis court which my whole family enjoyed. I'd also like to give kuddos to management. We had a small cleaning issue that they addressed immediately. They couldn't have been more responsive. So friendly and helpful. The unit was clean. We enjoyed the pool and beach, both were very close. The unit was equipped with many kids toys for the beach. It was a little crowded for 7 people, but we had a great time. We had a great week long stay in vacation rental condo on Sanibel Island. Easy walk to beach; tennis court and pool next to condo. Great bike paths just across the street to many shops, walking trails and Ding Darling Reserve. Would have liked more soap, toilet paper, dishwasher soap, sponges, etc provided. We had an amazing week at our condo. Four adults and two children fit just right (I'd recommend getting a bit bigger place if your children are teens or if you're trying to house six adults). The place was stocked with everything you would need for the pool and the beach. Our balcony overlooked the pool and the private beach access was just a short path. If you're looking to book this just remember a few items: it doesn't come with shampoo or conditioner and you'll need to buy additional dish soap and detergent. We had a wonderful week of beach, pool, and fun in the room. My daughter's, neices, and nephew are ready to head back! The apt has everything you need for the beach and the kitchen as well. I was very happy with our stay.